Worldwide, mental health problems are set to become the second greatest threat to health by the end of the next decade. The European Union has identified mental health problems as a growing concern, although there is great variation within EU countries with respect to patient numbers and the range of facilities available to them. Historically, EU mental healthcare services have been analysed using measurable aspects of care provisions such as throughput, costs and outcome measures. Little is known of the experiences, perceptions, beliefs and values of those accessing and providing services. This enlightening new book adopts a very different approach. With a particular focus on nursing, it examines and critiques the state of specialist mental health services in nine EU countries - Czech Republic, Finland, Ireland, Greece, Luxembourg, Netherlands, Germany, United Kingdom and Portugal. Each chapter focuses on a single country and ascertains existing services, their development, the treatments and care provided, factors preventing better service delivery, and suggestions for improvement. A rich pattern of differences emerge and comparisons can then be drawn. It also explores the emergence of an EU mental health identity in regards to selection of mental health personnel, their training and education, and the range of services they provide. Healthcare professionals and students with a particular interest in mental health issues (especially those with an interest in international approaches) will welcome the fresh analysis. 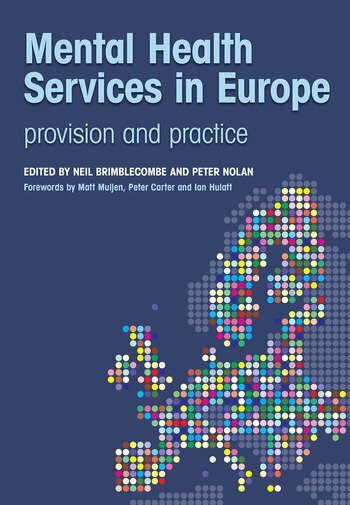 It provides vital new information for European policy makers and shapers, voluntary sector personnel, and service users and the organisations representing them. Introduction. Mental health need in Europe. Mental health services in the Czech Republic. National profile. Emergence of mental health services in Czech Republic. Impact of communism on mental health care. Current profile of mental health need. Types of services provided. Role of mental health nurses. Case scenario. Future developments. Mental health services in Finland. Population and demographics. The evolution of mental health services in Finland. Current structure of mental health services. Current mental health policy. Public attitudes towards mental health problems. Evidence of effectiveness in mental health care. The contribution of nursing to mental health services. Future plans for mental health services. Case scenario. Mental health services in Germany. National profile. Emergence of mental health services. Impact of partition. Current structure of mental health services. Public attitudes towards people with mental health problems. Approaches to quality measuring of effectiveness of services. The role of nursing in mental health care. Future services planning. Case scenario. Mental health services in Greece. National profile and context. History of Greek mental health services. Current mental health trends. The National Health Services. Public attitudes towards mental health problems. Deinstitutionalisation. Changing role of service users. Development of the nursing profession. Future directions of mental health services. Case scenario. Mental health services in Ireland. National profile and context. Ancient system of mental health care. Changes following independence. Current attitudes towards people with mental health problems. Current provision of mental health services. Mental health legislation. Roles of health professionals. Clinical Nurse Specialists and Advanced Practitioners. Future plans for mental health care. Case scenario. Mental health services in the Netherlands. Profile of the Dutch population. History of the involvement of religious denominations and mental health care. National expenditure of mental health services. Health needs versus health provision. Current mental health problems in the Netherlands. Critique of modern mental health care. Contribution of mental health nurses to mental health services. Future of mental health care in the Netherlands. Case scenario. Mental health services in Portugal. National profile and context. Problems associated with poor economic growth. Background to the emergence of mental health services. Changing health needs of the population. The national health service. Attitudes towards mental health problems. Future plans for mental health care. Case scenario. Mental health services in the United Kingdom. National profile and context. History of mental health services in the UK. Current mental health national profile. Prevalence of mental health conditions. Types of services available. Common mental health treatments. Services users experiences' of services and mental health nursing. Monitoring and effectiveness of services. The types of services provided by nurses. Future plans for mental health services. Conclusions - Is there a common European approach to delivering mental health services? Population and demographics. The development of mental health services. General health need. Policy and structure. Mental health need. Attitudes to mental health problems. Current mental health care. Mental health law. Case scenarios. Epilogue.